1.HDI PCB also calls High Density Interconnector PCB or HDI Technology , HDI circuit board is defined as a PCB with a higher wiring density with finer trace and spacing per unit area than normal PCB. They have finer lines and spaces, smaller via holes and solder pads and higher connection pads density than the conventional PCB design technology. HDI PCB is normally used to reduce PCB size and weight, as well as to improve electrical performance of the device. HDI PCB is the best alternative to high layer PCB, or small size PCB without enough design space. 2. HDI PCB are utilized to meet the customer demand for complex designs in smaller form factors across the majority of market segments, It is made through blind vias and buried vias and sequential lamination with insulation materials and conductor wiring for higher density of routing. HDI PCB includes laser-drilled blind vias and mechanical-drilled buried vias technology. This technology offers better electrical performance, access to advanced IC package also improved the PCB reliability. 3.Panda PCB provides HDI PCB manufacturing services to customers in the high end products. such as automotive industry, medical electronic device industry, semiconductor test equipment industry, mobile, computing, aerospace and defense industry. (Wireless pcb, Telecom pcb, Military pcb, Medical pcb , Semiconductor pcb, telecomunication pcb,and Instrumentation pcb). Although we serve a variety of customers, one thing is common-our customer's high expectations in quality, reliability, on-time delivery. Please contact us if you need any design help. 1.1+N+1 HDI PCB : contains 1-step "build-up" of high-density interconnection layers. 2. i+N+i (i≥2) HDI PCB: contains 2 or more step "build-up" of high density interconnection layers. 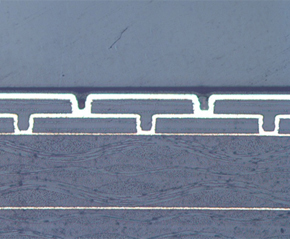 Blind vias on different layers can be laser drilled or stacked, Copper filled stacked microvia structures are commonly seen in demanding HDI designs. 3. Via on holes HDI PCB: Increased interconnection density by miniaturization of holepads and conductors.Provides the possibility to have a via hole connect direct in the SMD or BGA pad. 4. Any Layer HDI PCB: All the layers of a PCB are high density interconnection layers,Defines at least two layers of micorovia layers on either one or both side of core, or which allows the conductors on any layer of the PCB to be interconnected freely to other layers . 1. Better reliability,can result in improved manufacturing yield and board reliability. 2. Increase the wiring density,can reduce PCB layer count and footprint. 3. Increase design efficiency,can better protect signal integrity than alternative through-hole approaches. 4. Can improve the thermal properties.Reduce the cost also. 5. In favor of the use of advanced packaging technology. 6. Can improve the radio frequency interference, electromagnetic interference and electrostatic discharge . 1. Board Edge plating for half hole and ground connection. 2. Resin filled microvias and plating plug. 3. Stacked and staggered microvias. 4. Cavities hole with, countersunk holes or depth milling for special area. 5. Minimum track width and spacing can be 3/3mil in mass production. 6. Copper thickness down to 5 micron. 7. Complex rigid-flex HDI products. 8. Blind and buried via construction with sequential build technology.